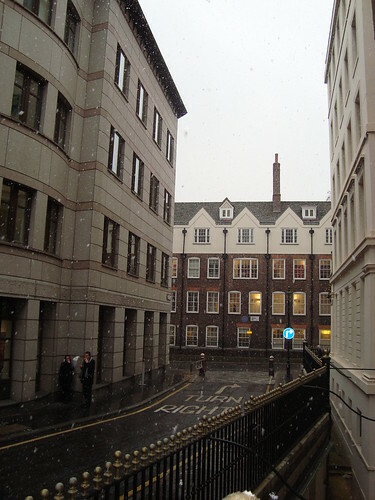 It snowed today in Central London. It wasn't a great deal of snow, and it didn't last for very long - but still, SNOW! 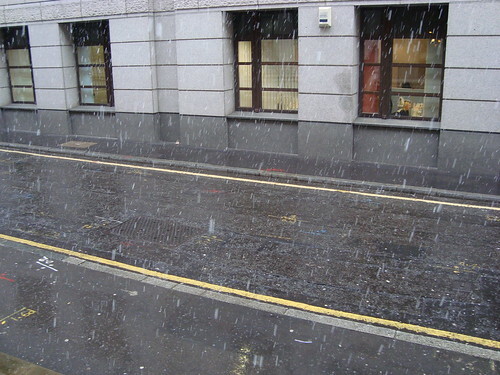 The last time it snowed in London was when I was back home waiting for my Visa, which I was gutted over missing. Suffice it to say that I was chuffed to see this today. I'm hoping to go to bed tonight and wake up to a blanket of snow - it's hardly going to happen, as it's mostly cold and rainy right now, but a girl can hope! This entry was posted on 08:21 and is filed under London Still . You can follow any responses to this entry through the RSS 2.0 feed. You can leave a response, or trackback from your own site. Yay! So lovely. It's so beautiful when it snows in a big city. Also, I like that even though where you're from, Christmas happens in the summer, you still associate snow with the holiday. We might get more tomorrow-- I'm a bit excited :) I was watching it out the window of our office yesterday. I didn't think to take my camera outside though! oh yay i love snow!